[202 Pages Report] The global packaging printing market was valued at USD 328.95 Billion in 2015 and is projected to reach USD 574.47 Billion by 2026, at a CAGR of 5.3%. The base year considered for the study is 2015 with the market size projected for mid-term is from 2016 to 2021 and long term from 2016 to 2026. The primary objective of the study is to define, segment, and project the packaging printing market size on the basis of printing inks, printing technology, material, application, and region. The study also aims at strategically analyzing micromarkets with respect to individual growth trends, future prospecdts, and their contribution to the total market. It also provides detailed information about the main factors influencing the growth of the market (drivers, restraints, opportunities, and industry-specific challenges). 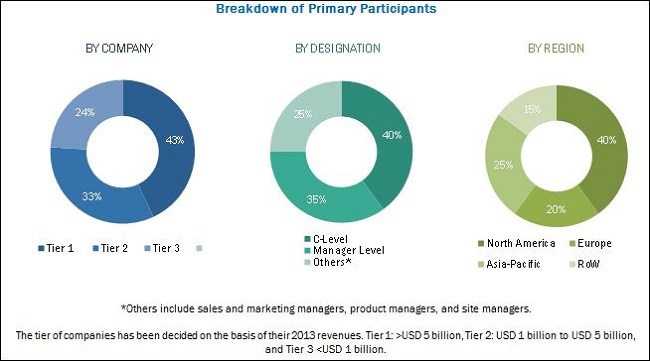 In addition to this, the study analyzes competitive developments such as agreements & partnerships, acquisitions, new product launches, expansions & investments, and research & development activities in the packaging printing market. The research methodology used to estimate and forecast the market size included the top-down approach. The total market size for packaging printing was calculated, and accordingly, the percentage was allotted to different sectors in each of the segments, which were done on the basis of extensive primary interviews and secondary research. Primary research involved in this report includes extensive interviews with key people such as CEOs, VPs, directors, and executives. After arriving at the overall market size, the total market was split into several segments and subsegments. These data triangulation and market breakdown procedures were employed to complete the overall market engineering process and arrive at the exact statistics for all segments and subsegments. The breakdown of profiles of primary respondents is depicted in the figure below. The market ecosystem involves various stakeholders in the packaging printing market. It starts with the raw material suppliers such as Eastman Kodak Co. (U.S.), Quantum Print and Packaging Ltd. (U.K.), Toppan Printing co, ltd. (Japan), Quad/Graphics Inc. (U.S.), and Traco Manufacturing, Inc. (U.S.), who are the manufacturing companies of the printers which are used for printing on the packaging. The next level in the chain involves the assembly team that is monitored by the manufacturers such as HP Inc. (U.S.), E.I. du Pont de Nemours and Company (U.S.), Xerox Corporation (U.S.), WS Packaging Group, Inc. (U.S.), Mondi plc (South Africa), and Xeikon N.V. (Netherlands). It is followed by the marketing and sales of the finished products, which is only possible if an efficient distribution channel is developed. Finally, the end products are distributed to the consumers. This research report categorizes the packaging printing market based on printing ink, printing technology, material, application, and region. 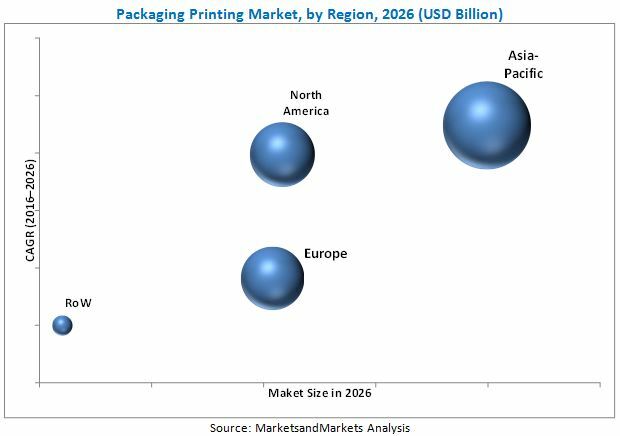 MarketsandMarkets projects that the packaging printing market size will grow from USD 328.95 Billion in 2015 to USD 574.47 Billion by 2026, at an estimated CAGR of 5.3%. The packaging printing market is expected to witness high growth as a result of the growing demand for suitable printing & increasing demand for packaging printing. This report has been segmented on the basis of printing ink, printing technology, material, application, and region. Food & beverages of the application segment is projected to be the fastest-growing in the packaging printing market during the forecast period, as it requires packaging for storage, handling, and transportation of food products & beverages. On the basis of printing inks, the aqueous ink segment is projected to grow at a higher rate in the forecast period due to its low cost, printability on various surfaces, and waterproof features. In terms of value, the flexography printing segment of printing technology is accounted for the largest market share and is projected to grow at a moderate CAGR during the forecast period. This growth can be attributed to its ability to print images that are superior in quality and to withstand various climatic conditions. However, the digital printing sector of the printing technology segment constituted a moderate share in the packaging printing market; but is projected to grow at a higher rate during the forecast period as it is highly preferred for packaging printing in personal care & cosmetics products, because of aesthetic appeal facility to attract consumers at point-of-sale (POS). In terms of value, the labels of the material segment of packaging type is accounted for the largest market share and is projected to grow at a higher CAGR during the forecast period. This growth is due to its application in almost all types of packaging variables. Labels are the mostly used packaging type as they display product information, brand identification symbols, and transportation details during shipping. Under application, the food & beverage sector is projected to grow at a higher rate due to the high demand for food packaging and the growing trend of digital data printing on food packages to communicate the shelf-life, composition, and nutritional value of the product. In 2015, the Asia-Pacific region accounted for a higher share in the total market of packaging printing market, in terms of value, followed by Europe and North America, owing to manufacturers’ focus on developing low-cost packaging printing options. However, as the packaging printing market in developed countries is getting matured, the markets in China and India are projected to grow at higher rates from 2016 to 2021. The Asia-Pacific region is projected to register the highest growth during the forecast period due to the region experiencing growing e-retail sales, coupled with a growing convenience packaging in the food industry. High initial capital investments has caused an unfavorable impact on the profitability of the printing industry. The global packaging printing market is dominated by players such as HP Inc. (U.S.), Xerox Corporation (U.S.), Toppan Printing co, Ltd. (Japan), Quad/Graphics Inc. (U.S.), Mondi plc (South Africa), i.e. Du Pont De Nemours and Company (U.S.), and Kodak Co. (U.S.). These players adopted various strategies such as new product launches, acquisitions, agreements & partnerships, and expansions to cater to the needs of the packaging printing market. 12.5 Toppan Printing Co., Ltd.
12.10 Quantum Print and Packagin Ltd.
12.11 WS Packaging Group, Inc.
12.12.3 Edelmann Packaging México S.A. De C.V.
12.12.7 Toppan Printing Co., Ltd. Figure 37 SWOT Analysis: Canon, Inc.